Step aside Kate! I know everyone is going nuts over the royal wedding today, but Kate isn't the only princess attending a fancy bash. Tomorrow, Henry and I are going to the Storybook Ball at the Please Touch Museum. And as you can see from the photo, I'll be dressing like my favorite princess, Rapunzel. Don't you love my long hair? Henry will be going as Woody from Toy Story. It should be great fun, and we'll tell you all about it next week! My very first ball — I can't wait! That last one is my favorite. I wish I could get Henry to be my royal servant all the time! Our Easter was happy indeed. I was up bright and early Sunday morning so I could see what the Easter Bunny left for me. He hid my and Henry's baskets, and I was excited to discover that yes, he got me the little Rapunzel figurines I had been hoping for. There were some other goodies too, like colored bubbles (which ended up making a mess!) and Easter candy, including a chocolate bunny. Delicious! Henry loved his too. In the picture above, he's pointing at his Easter Bunny gift: a talking James train (from Thomas & Friends). After going to church, we went over to Babcia and Dido's for our Easter feast. Grandma, Grandpa and Aunt Jess were there too. There was lots of good food, but we were most excited about the Easter Bunny cake. After the meal, and after Henry woke up from his nap, we took a few family pictures for Easter. Here's a video of some of our Easter highlights, especially finding our baskets in the morning. As I told Mom and Dad, it was the best Easter ever! The day before Easter, Julia and I were busy with lots of Easter activities, including another Easter egg hunt (we were going to do it in the backyard, but it poured so we had to do it indoors). Then we donned our fancy Easter outfits to go to Babcia and Dido's Ukrainian church for the annual blessing of the Easter baskets. See how spiffy I look! And Julia too! 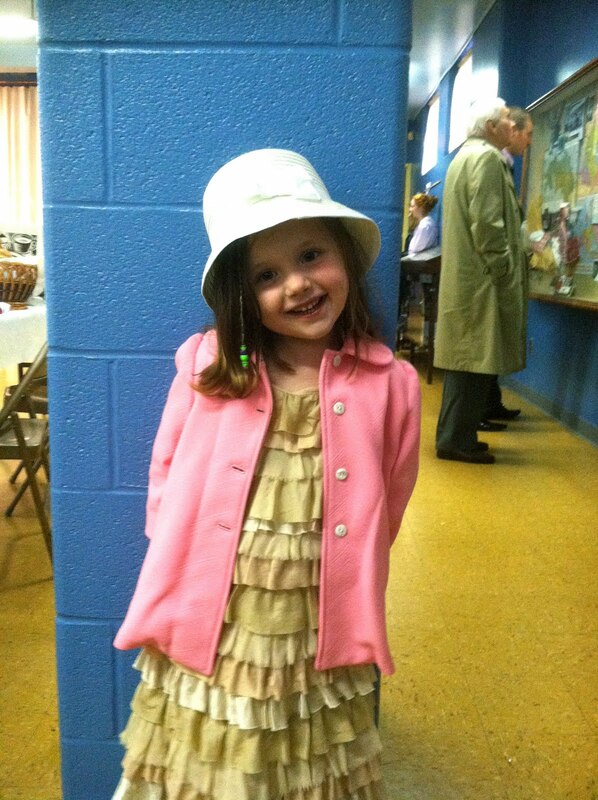 What a terrific Easter dress! Julia also had a special Easter bonnet and jacket—the same jacket that Babcia Helen (Babcia's Mom) made for Mom when Mom was a kid! Here we all are at the blessing of the baskets. We had three baskets to be blessed. Julia's is on the left, then mine, then Babcia and Dido's. It was a little too crowded for my tastes, so I ran around with Dad in the stairwell while the blessing was going on. After the blessing, we went out to dinner with Babcia and Dido and had a special surprise: any impromptu run-in with the Easter Bunny! And Sunday was even better! We'll tell you about it tomorrow. Easter's almost here! Julia and I got an early taste of it last weekend, when we went to a Easter egg hunt at one of the local parks. Alas, there was no candy in the eggs, just tattoos (which are fun too!) and little toys. 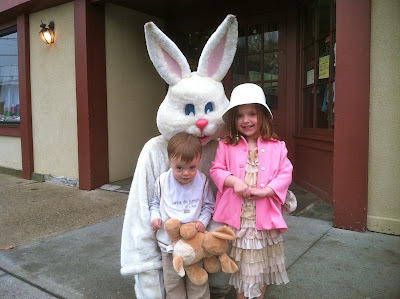 Then we got to meet the Easter Bunny himself! In addition to having weekly playdates, Isabella and I have been going to the same Little Gym class whenever we can. 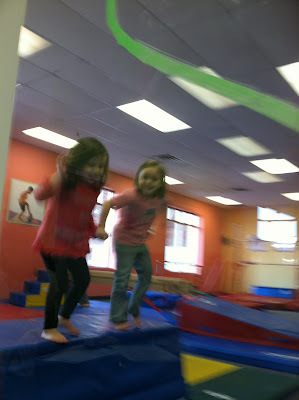 This picture is a bit blurry, but as you can see we have so much fun together at Little Gym! I got a bit distracted mid-plan as I started thinking about the pancakes Mom was going to make the next morning. But won't I make a beautiful bride one day? Also, you're probably wondering what I'm wearing: it's one of my new Princess Tiana nightgowns! Isn't it super-fancy? Hi everyone! Julia and I didn't mean to go AWOL this week...it just kind of happened. But I wanted to check in before the end of the week and share my big news: in only one week's time, Dad transitioned me to falling asleep while he sits in a chair outside my bedroom with the door opened just a tiny crack. Dad said it took months to get Julia to that point! Anyway, have a great weekend, and we'll have new photos and videos for you next week! P.S. Remember Ask Julia & Henry? Probably not, because we haven't had a question all year! So why not send a few our way? I've been sleeping in really late these past couple weeks, but whenever I do get up on the earlier side, Julia likes to ask Mom and Dad if she can go into the crib and cuddle/play with me. 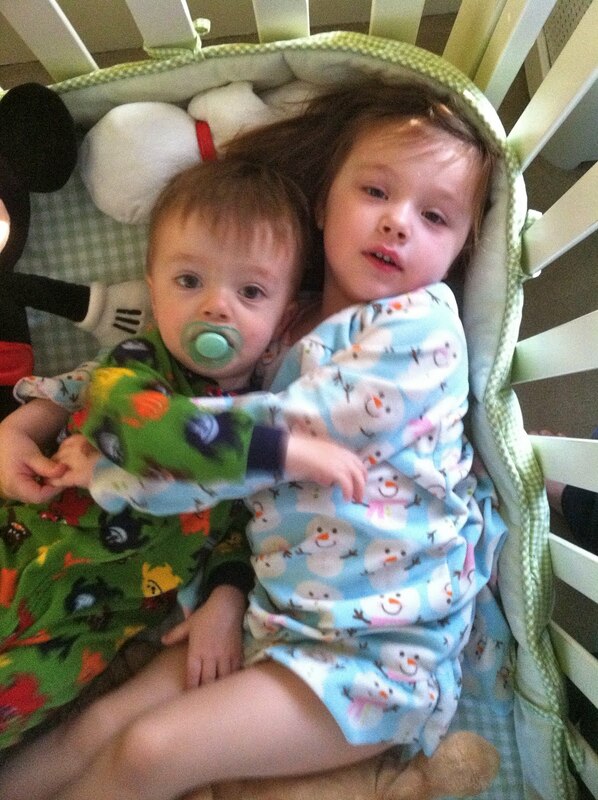 We always have fun being silly and running around the crib—and sometimes we just hug. A couple weeks ago when Mom and Dad were on vacation, they took Henry and I to the Bronx Zoo. We've been to lots of zoos, but we had still never been to that one before so it was great to finally get to see it for ourselves. It was a chillier day than we had been expecting, so Henry and I were a little less energetic than you would have expected, but we still had fun seeing all the animals. Henry especially had a great time motoring around the zoo. I'm just glad we went before that cobra escaped the other week. That would have been scary!